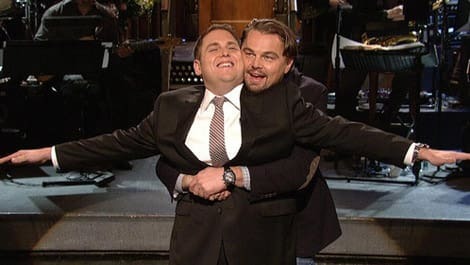 Jonah Hill and Leonardo DiCaprio. The Wolf of Wall Street stars recreated DiCaprio's scene from Titanic. Jonah Hill was born Jonah Hill Feldstein on December 20, 1983. He has quickly grown to become a star thanks to comedies like Accepted, Knocked Up, and Superbad.